Discover the latest offers and new products at John Lewis. The John Lewis Price Promise ensures you always get the best price. John Lewis constantly monitor competitor’s promotions to give you the lowest prices. Simply select the product you are looking for to see how much you will save. The John Lewis Holiday Shop is open with the latest Summer styles for women and men. Summer is the perfect time of year for a wedding. Shop from the beautiful selection of wedding dresses, shoes and accessories. Brides will make a striking entrance in a head-turning gown. Whether you opt for exquisite embellishment, simple satin or traditional lace, find the perfect dress from the John Lewis range of timeless shapes or contemporary styles. Looking for baby and child? The Nursery Checklist is designed to ensure you have everything you need for your baby. From prams to highchairs, bottles to booties, carseats to nursery furniture. You will find it all for your precious little one. Selected baby brands include Bugaboo, iCandy, Joolz, Quinny, MaxiCosi and Britax. 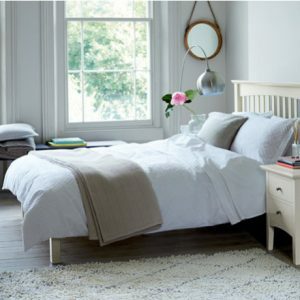 Find home accessories and furnishings from the range of homeware at Marks and Spencer. A good night’s sleep starts with great bedding. Choose crisp sheets, dreamy duvet covers and soft pillowcases from the collection of plain linen or pretty patterns, available in a rainbow of colours. Shop by room to select the perfect items for the decor of your home. Finish the look you desire with mirrors, lighting and soft furnishings to create a warm ambience. Enjoy offers in the Marks and Spencer sale with amazing reductions on women’s and men’s fashion, children’s clothes, lingerie, beauty and homeware. Shop for clothing, homeware and beauty before 8pm and collect your order tomorrow from midday at Marks and Spencer in the Canary Wharf shopping centre. Delivery to your chosen Marks and Spencer store is free. Get free home delivery on orders over £50. You can make free returns within 35 days by post, store or locker.